IV therapy is rapidly growing in popularity both here in Utah, and throughout the rest of the United States. 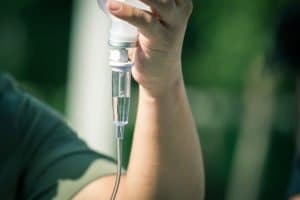 While the concept of hospital patients receiving an IV to deliver both medication and hydration during their recovery process is almost universally known, applying those same healing principles outside of a hospital bed has only recently gained momentum. But that momentum is real, and it’s not slowing down. Patients in need of a rapid recovery can get exactly that through IV therapy, and it’s not just limited to re-hydrating a person, as common misconception would indicate. IV therapy is capable of directly injecting various concentrations of vitamins directly into a patient’s veins, usually with a specific focus in mind for that particular treatment. If a patient is suffering pain from aching bones and sore muscles after intense physical strain, there’s an IV cocktail specifically aimed to accelerate that healing. Needing a boost to your immune system from the crummy air in Utah’s winter months? A cocktail loaded with things like vitamin-C and zinc will help do the trick. Need some rapid repair to overworked muscles after climbing one of the Salt Lake area’s toughest hiking trails? An infusion of amino acids will set you on the right track. Those are just a few examples too of the kinds of cocktails available, and the medical situations they can help improve for patients. IV therapy is helping people all over to recover more quickly and more effectively from minor ailments than simply ingesting some pills and resting up. By infusing these treatments and vitamins directly into the bloodstream, their healing properties reach the parts of the body in need of healing much more quickly than any other form of treatment. And all of that is without the potential damage that some medications can cause to things like the stomach lining or small intestine. Utah is a great place to call home, with plenty of great outdoor activities to enjoy. You shouldn’t have to pay the price of soreness and fatigue for the days and weeks following an outdoor adventure. And whether it be for recovery of an ailment or prevention of future ones, IV therapy can be a your solution for both getting back to, and staying, at 100 percent health!